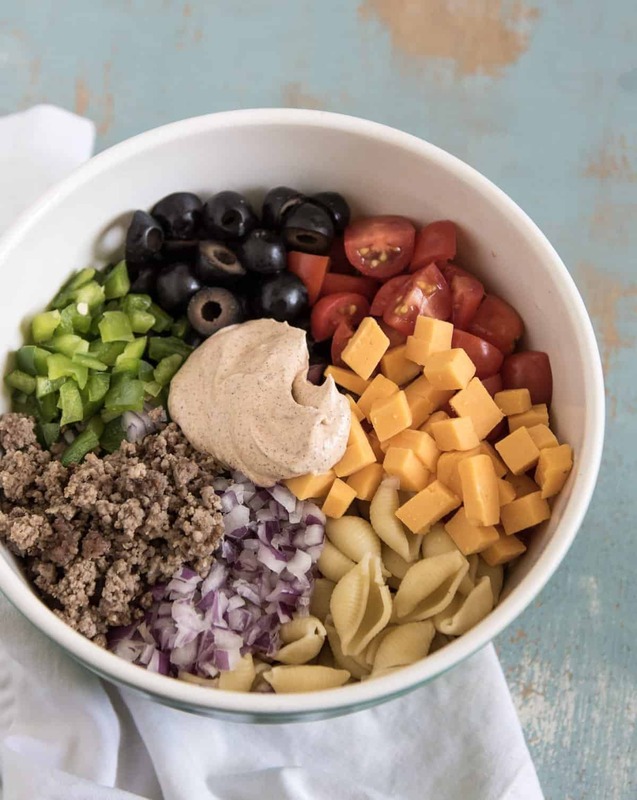 Creamy taco pasta salad made with pasta, hamburger, chopped vegetables, and a creamy taco-inspired dressing to bring it all together. Bonus: It’s done in about 20 minutes! 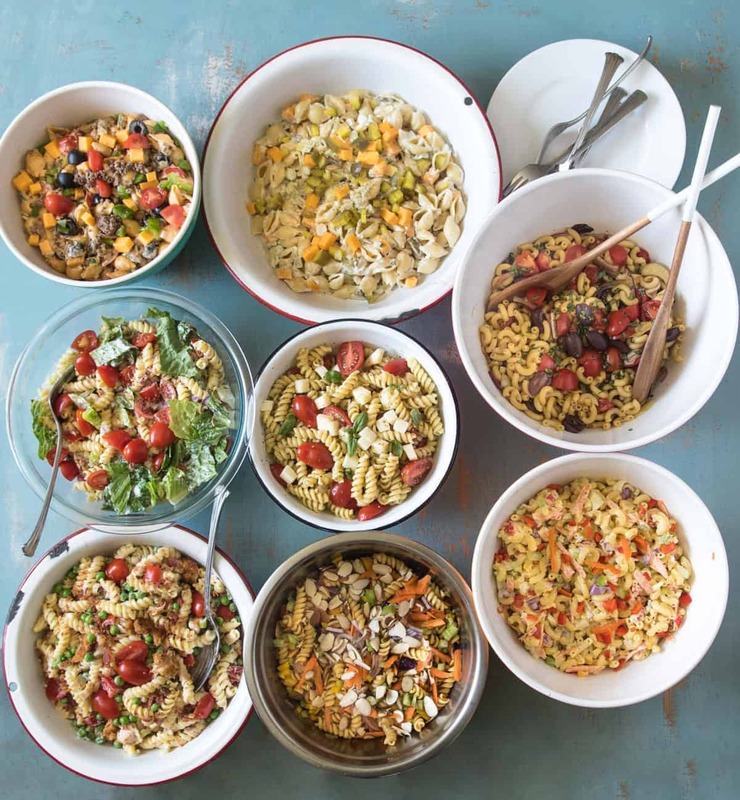 You all know my love of all things taco/Mexican, and this pasta salad is right up my alley. I love this stuff and could eat it over and over again. 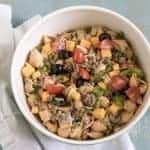 I love this taco pasta salad recipe because it’s hearty enough to serve as a main dish and simple enough to make as a side for a picnic or cookout too. Who doesn’t love a side that you can also use as a main dish? You know what that means? You are going to make this recipe over and over again this summer. Serve it up with some homemade lemonade, and you’ll have yourself one delicious summer meal! I added a half of a pound of ground beef to this recipe (though it’s super easy to make it meatless too, just see my notes below), and that makes this a very economical main dish. You can get away with serving just that half a pound of meat to a family of four for dinner; I love light-on-meat meals as much as I love meatless meals! I think my favorite part of this dish is the super simple creamy dressing that you mix together to bring this all together. It’s mayo and sour cream mixed with all kinds of spices. Have you tried smoked paprika yet? It’s so good! You could coat just about anything with that dressing, and it would taste great. I can’t wait for you to make it. Want to make this meatless? Omit the hamburger and add a can of black, small red, or pinto beans instead (or add those in addition to the hamburger to add another serving or two on the cheap). My auntie makes a taco salad super similar to this but she adds a few cups of chopped lettuce and some crushed Doritos or tortilla chips just before serving. Delicious! Feel free to serve this with some sliced avocado and hot sauce on the side. Plan on this feeding 4 adults as a main dish (or 2 adults and some kids), or 8-10 as a side. If you are making this ahead of time, keep the dressing separate and add it right before serving. Planning on taking this to a party? I love this set of 4 bowls with lids from Costco (which you can purchase on Amazon). 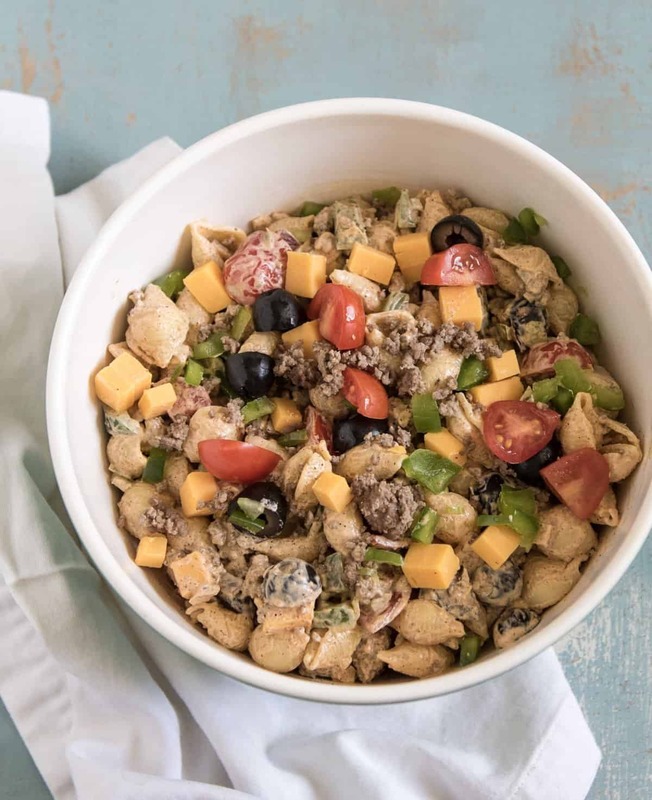 Creamy taco pasta salad made with pasta, hamburger, chopped vegetables, and a creamy, taco-inspired dressing to bring it all together. Bonus: It’s done in about 20 minutes! While the pasta cooks, in a small skillet cook the hamburger over medium-high heat until the meat is cooked through and no longer pink. Drain extra grease and set aside. In a small bowl combine the mayonnaise, sour cream, chili powder, cumin, smoked paprika, garlic powder, and salt. Stir to combine. Add the pasta to a medium mixing bowl. Add the cooked hamburger, bell pepper, olives, tomato, red onion, and the cheddar cheese. Add the mayonnaise mixture. To make this meatless sub the hamburger for a drained and rinsed can of black or pinto beans. If you loved this Taco Pasta Salad recipe as much as I did, then you are going to love all of the other pasta salad recipes that I have coming!